Kenmare News | Climb aboard the ghost train! Climb aboard the ghost train! Sick of Brexit? Then climb aboard the ghost train that leaves Kenmare on March 29th, 30th and 31st, and April 1st. The curtain goes up at 8pm, and you will be transported to another realm, if you dare! And to be safe, don’t come alone, bring a friend! The Carnegie Players return with a spooky production ‘The Ghost Train’ by Arnold Ridley which will intrigue as well as frighten you. 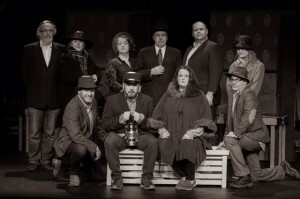 It will also amuse you greatly, packed as it is with comedy delivered by the best actors the Carnegie Players possess. Book early and don’t lose out, whatever Brexit brings, you can escape on the ghost train, but only if you dare!